Map courtesy of Tennessee Gas. 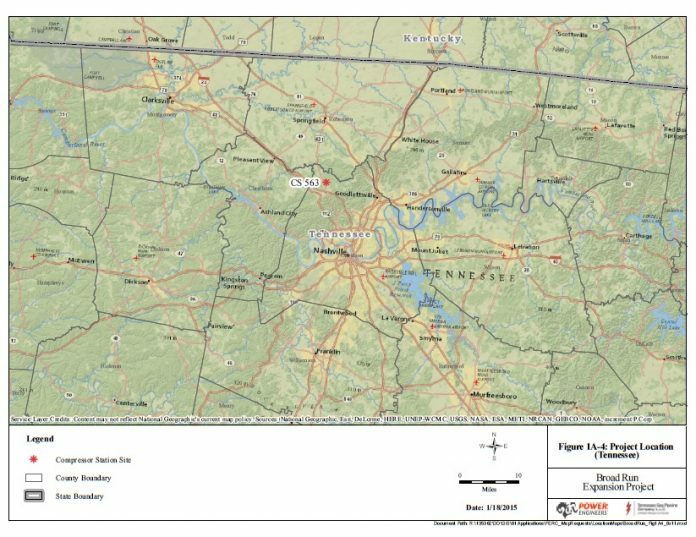 Tennessee Gas Pipeline Company LLC (Tennessee Gas) has been granted US Federal Energy Regulatory Commission (FERC) approval to begin construction on Compressor Station 563. Part of its Broad Run Expansion Project, the compressor station will be built in Davidson County, Tennessee, USA, and include two 30,000-hp (22,380-kW) Solar Titan 250 turbine-powered compressor units, as well as construction and installation of a compressor building, station piping, gas filters, gas coolers, and other ancillary equipment. Station piping will be designed for a maximum allowable operating pressure of 1000 psi (69 bar). The new station will be designed for bi-directional flow, providing compression for gas moving north or south on the Tennessee system. When completed, the Broad Run Expansion Project will provide 200 MMcfd (566,337 m3/d) of capacity to meet market needs in the southern United States. Tennessee Gas, a Kinder Morgan company, filed its application with FERC on January 31, 2015. As part of the project, the company will construct, install, modify, operate, and maintain compression facilities in West Virginia, Kentucky, and Tennessee, USA. For more information on the project, see Turbine-Powered Compression For Broad Run Expansion Project.